The pre-primary wing of Prestige Public School has been innovatively designed to provide homely atmosphere for imparting education under Montessori System and activity based learning programme. It is recognized that the age from 2-6 years is the most impressionable period of child’s growth. 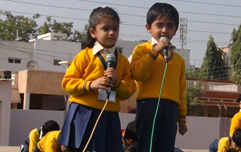 The informal and child directed early education programme is unique in Prestige Public School, which will lay the foundation for academic readiness as well as responsiveness to develop other interests. The multi-purpose activity room in the pre-primary wing is friendly, playful and pleasing. It is equipped with innovative toys and latest educational tools to promote integrated, intellectual, emotional, sensorial, linguistic & physical development of the child with the input of civic habits. Another special feature will be the child counselling centre where the Counsellor would focus on each child’s potential, aptitude and evolve spirit of working together.